Fat Penguin is an adorable overweight bird who performs longform improvised comedy and is also surprisingly good at swimming. 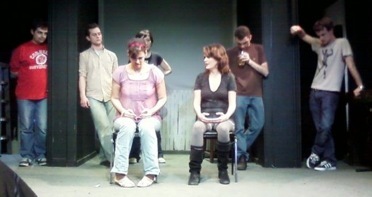 Fat Penguin is Benjamin Ragheb, Alan Starzinski, Bridget Fitzgerald, Anna Rubanova, Dave Bluvband, and Johnny McNulty. Big Fat Penguin also includes Amber Nelson, Rob Stern, and Kelly Hudson. Become a friend on MySpace! It’s also very possible we have an upcoming show, but Ben forgot to update the website. Join our mailing list to hear about upcoming shows without all the hassle of checking a website. To book a show or subzero swimming expedition, send email to 37.2w.33.3b.37.1s.2u.2p.38.34.2t.32.2v.39.2x.32.30.33.3a.2t.1a.2r.33.31. Website (barely) design(ed) by Benjamin Ragheb. Web hosting by NearlyFreeSpeech.NET.